If you‘re concerned that painful joints and bones will force you to live life from the sidelines, it’s time to STOP worrying and start Living Again! This breakthrough nutritional discovery could help you regain the mobile, active lifestyle you deserve safely, naturally and without adverse side-effects! If you or a loved one have concerns about poor bone and joint health, it’s time you put the breakthrough 11-in-1 Ultimate JointFlex formulation to the test. Do you experience stiffness in your joints when you wake-up... Pain after exercise or work... Difficulty climbing or descending stairs or chronic joint tenderness or swelling? The culprit behind the vast majority of joint pain is worn, torn or missing cartilage – the natural 'shock absorber' in your joints. And the only way to really help your joints is to give them what they need to maintain good health. complete joint health without drugs or surgery – at any age! Not only that, as we’ve seen with the recall of Vioxx, Bextra and other NSAIDs, the side-effects of these drugs can be devastating. These include stomach irritation, high blood pressure, diarrhoea, peptic ulcers, kidney failure and liver damage. And painkillers have also been linked to 80% of cases of gastrointestinal ulcerations and bleeding – 10% of which are fatal. But the medical profession continues to turn a blind-eye to natural joint-health solutions that have been shown to be safe in study after study. The joint formula that works! By supporting your joints from the inside out with Ultimate JointFlex you could soothe your joints, rebuild cartilage and halt deterioration in your joints – safely, naturally and without any adverse side-effects. Time and time again, I’ve heard from people who have tried Ultimate JointFlex and were thrilled to find the answer to their joint problems. If you’re concerned about a sore back or neck... tender knees or hips... creaky wrists or knuckles... throbbing shoulders or elbows... or any joint discomfort at all... it’s time you learned about Ultimate JointFlex and the mountain of testimonials regarding the effectiveness and safety of its breakthrough 11-in-1 formulation. “My 87-year-old mother couldn’t visit us this summer due to a painful hip. She had to walk with a cane and give up her beloved golf and gardening, and she accepted it as ’part of growing old’ with resignation. I sent her two bottles of Ultimate JointFlex. And she just called to say that after 3 weeks, she had put away the cane, and was back playing golf! Felicia is just one example. Her story of renewed health – and hope – is just like countless others I’ve heard, from people expressing genuine gratitude for this amazing drug-free joint-health breakthrough. I’ve included just a few of their remarkable stories in this Special Health Alert. But first, read on and learn all about the “extraordinary” compound called Ultimate JointFlex. Discover how it could help you live with flexible, mobile joints every day, so you can do the things you really want to do! Take it from me – sore, tired joints are not an “inevitable” part of ageing. It’s true that natural 'wear and tear' takes a toll on our joints and the cartilage that cushions them. Until recently, this gradual (but sometimes rapid) deterioration, and the accompanying stiffness, irritation and swelling, was accepted as a “fact of life” to be endured as we grow older. But now you can throw that thinking right out the window! Full relief to her utter surprise! As a natural health researcher, I’ve seen first hand how nutritional therapies can work wonders for thousands of people. And I knew we had at our fingertips an arsenal of natural weapons that could help people keep their joints flexible and discomfort-free. That’s why I was pleased to see FSP Nutritionals create one of the most effective, most cutting-edge natural alternatives for boosting joint health ever developed. One that could ensure soothing comfort to joints, restore lost movement, and rebuild and nourish joint cartilage worn down by decades of hard work and grinding contact. The result is Ultimate JointFlex. The “Perfect 11” for ultimate joint health! You see, not only does Ultimate JointFlex speed help to your hurting joints, it harnesses the repair power of 11 extraordinary joint-health warriors in one turbocharged formula! Rebuild healthy, new joints from the inside out! And helps you regain the healthy active life you deserve... into your 60s, 70s, 80s and beyond! Since Ultimate JointFlex’s multi-nutrient formula addresses joint health from all different angles, it could achieve remarkable results even in situations where other natural solutions may have fallen short! The evidence is in – Ultimate JointFlex works like gangbusters! It’s called Methylsulfonyl Methane – or MSM for short – and science has finally unlocked its powers, thanks to 19 long years of research by the award-winning scientist Dr Stanley W. Jacob. MSM is a naturally occurring source of bioactive sulphur. Our bodies need sulphur for healthy connective tissue and joint function. When we’re young, our MSM supply is abundant. But as we get older, it decreases dramatically. This causes your joint cartilage to break down. And cells literally become hard and stiff. But restore your MSM supply, and wonderful things could start to happen. Cell walls become flexible. The natural healing process in your cartilage is increased. Your body’s natural joint-health boosters go back to work. Before you know it, you could feel healthier, younger, more agile, and more energetic. According to Dr James F. Balch, MSM helps detoxify the body on a cellular level; nourishes hair, skin and nails; and promotes gastrointestinal health. Energetic on the job again! Tackles chores without the agony! “I’ve worked as a distribution manager for many years, which means walking on hard concrete floors and running up and down stairs constantly. After years of wear and tear, my knees were showing their age. I tried aspirin, ibuprofen and naproxen first. All they did was to tear up my stomach. Then I tried prescription drugs, which helped but made me feel awful. And finally I had cortisone shots until I couldn’t have any more. So when Ultimate JointFlex came out, I was more than ready and willing to try it. And I’m glad I did. The results were amazing. Within one day I felt better. There was more flexibility. I could get around and do my job without discomfort. Ultimate JointFlex is definitely the best of everything I’ve ever taken! Sound good so far? It gets even better. Unlike NSAIDs and steroid treatments, users have actually reported that Ultimate JointFlex’s joint-rejuvenating power actually increases with daily use. Glucosamine HCL is a big reason why. Scientists refer to glucosamine as an essential “building block” for good joint health, since it’s a vital component for the repair and growth of new cartilage. Young, healthy joints usually produce their own supply of glucosamine. But as we age, production slows. Less glucosamine means less natural repair power for cartilage and joints – and you know only too well what happens next! Luckily for us, over time, glucosamine supplementation can stimulate cartilage and bone growth and actually help maintain joint structures. And I have many testimonials from others who agree! Combine glucosamine with MSM, and Ultimate JointFlex already delivers amazing double-duty action for boosting joint health. Researchers found that chondroitin helps reduce pain, increase joint mobility and decrease the need for painkillers. It's no wonder when you think it's a vital part of cartilage, giving it elasticity. Other studies have found that taking chondroitin can prevent cartilage breaking down and can also stimulate its repair mechanisms. It also reduces the activity of enzymes and substances that break down collagen in joints, and has powerful anti-inflammatory properties. This kind of joint-building power is exactly what you need to “jump start” healthy joint cartilage and bone! Ginger Root – Stops inflammation in its tracks! It’s one of the all-time astonishing medicine herbs, prized for centuries by Chinese Traditional Medicine healers... to the ancient Ayurvedic doctors of India... and even the medical practitioners in ancient Greece. But it was the Carribean Islanders who truly discovered its potent powers for reducing joint inflammation and tenderness – while increasing circulation as well! Doctors throughout parts of Asia and Europe rely on Ginger to halt tenderness and inflammation in their patients with joint concerns. Working full-time days with part-time joints? If you’re one of the millions of people who end the day feeling far worse than you started it, you’re not alone. One expert, Dr Margareta Nordin atNew York University, estimates that nearly every person will suffer work-related aches sometime in his or her career. In fact, a recent Lou Harris & Associates survey found that a whopping 68% of people experience joint stiffness on the job! If your joints call it “quits” before your day is done, give them a powerful supportive boost with Ultimate JointFlex. Clinical research has documented the soothing, joint-building benefits that accrue with the healthful nutrients in Ultimate JointFlex. It could help make your long day easier to tackleand your free time easier to enjoy! Ultimate JointFlex has helped countless people find relief from the damaging effects of long term repetitive tasks, overexertion or just running themselves ragged on the job. Here are a few! Boswellia serrata – Derailing soreness before it begins! Natural Ayurvedic healers in India have been using boswellia serrata for over 1,500 years – and it may be the most amazing herbal anti-inflammatory in all of nature. That’s because researchers have found that it successfully impedes the leukotriene cycle – which effectively stops inflammation before it can even start! Now, can you just imagine what boswellia could do for you? Give your tired, worn joints a new lease on life! Imagine waking up, sitting up and stretching – and not feeling the stiffness and aches! People from all walks of life have reported an amazing sense of revitalisation and rave about once-tender joints that feel practically “like new” – thanks to Ultimate JointFlex. That’s because Ultimate JointFlex gives joints the full nourishment and daily support they’re crying out for! Next, Ultimate JointFlex continues to go to work on inflammation with two more remarkable compounds: EPA and DHA. EPA and DHA are considered Omega-3 fatty acids, important nutrients that occur naturally in your body. But not only do Omega-3 fatty acids mask inflammation, they actually stop the auto-immune reactions that cause it. Patients report less joint stiffness, swelling and tenderness when taking Omega-3 supplements. As well as less long-term dependence on non-steroidal anti-inflammatory drugs. Imagine feeling great without painkillers? These two compounds can help make it possible. Most people don’t get enough Omega-3 fatty acids in their diet, so Ultimate JointFlex helps fill in the gap. Vitamin C is an important building block in the formation of cartilage, collagen and joint tissue. But it also has important preventive benefits as well. According toresearcher Dr Deborah Symmons, “Vitamin C is a scavenger of free radicals, which are known to be produced in inflammatory conditions like arthritis.” These freeradicals are found in the joint fluids of patients with rheumatoid arthritis and inflamed joints. Vitamin C can play an important role in preventing free radical damage. We all know that vitamin D is essential for healthy bones and teeth. But vitamin D has also been shown to play an important role in the synthesis of synovial fluid – the fluid found in and around joints to keep them lubricated and flexible. Just another reason to get out in the sun, soak up that vitamin D providing sunlight... and nourish your joints with Ultimate JointFlex each day. Not only is vitamin E shown to be necessary for optimal immune function, it has also been known to be an effective natural anti-inflammatory when up against joint stiffness! Plus, recent research suggests vitamin E’s powerful antioxidant properties may help prevent damage to joint tissue caused by heavy work and stress to the joints. They are potent antioxidants that neutralise free radicals – produced in arthritic joints and which cause damage to them. Only Ultimate JointFlex packs the incredible power of 11 joint-health nutrients in the exact ratio and dosages I’ve found to be the most effective. Each includes the optimum dosage of important joint-protectors like MSM, Glucosamine and Chondroitin... as well as high-performance levels of Boswellia, EPA, DHA and four additional nutrients. Sure, you could take them all separately. But why waste your money on separate supplements that may do little or nothing when, for less cost, you can have one, effective formula that does it all? Thanks to Ultimate JointFlex, you can! Earlier in my practice, I met too many wonderful people whose vibrant lives were tragically transformed by the progressive problems associated with poor joint health. It was heartbreaking to watch them cope with pain that seemed to get worse daily. But it was just as awful watching them give up the gardening or golfing they loved... lose their ability to take a simple walk or drive... forego pleasures like shopping and visiting friends... and ultimately surrender their independence altogether. No doubt you have similar memories of loved ones or acquaintances. Of course, we can’t change the past, but we can take charge of our future. With what we know today about joint health, we can help make sure this doesn’t happen to us. As we’ve so painfully seen, one can’t rely on drugs alone. Drugs have sometimes-devastating side-effects and do nothing to address the foundation of joint health. 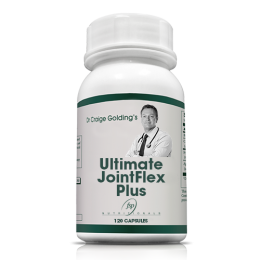 But Ultimate JointFlex provides an amazing army of joint-support warriors shown to relieve discomfort, build cartilage, and protect the health of your joints for years to come. Whether it’s playing with your grandkids, fishing with your buddies or travelling cross-country on a trip you’ve always dreamed of, Ultimate JointFlex could help you live the way you want to live.. So if you’ve just started feeling the effects of lifetime ‘wear and tear’ on your joints, it’s crucial to begin replenishing them now before serious damage occurs. 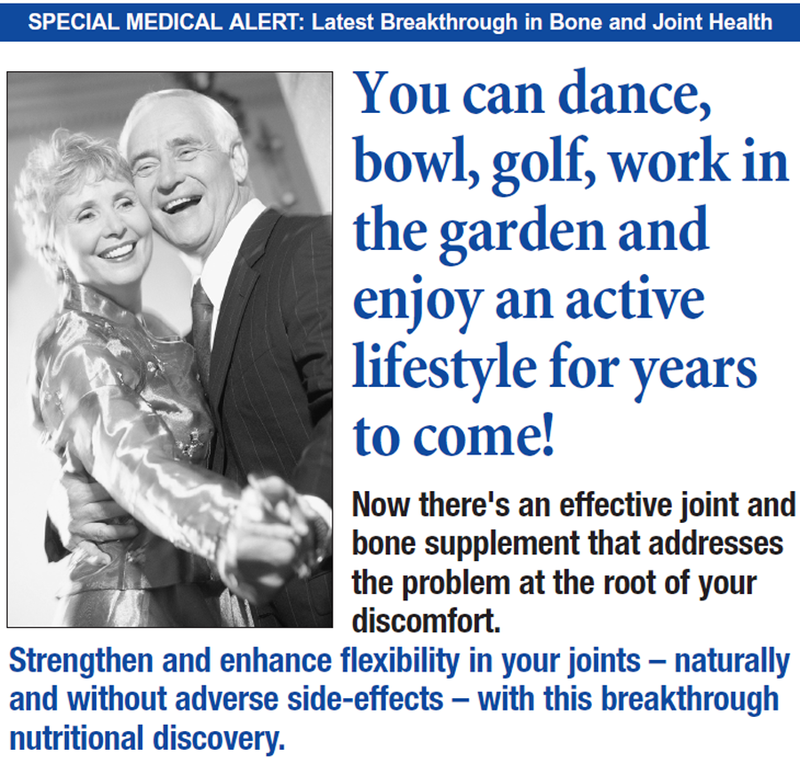 And if you’re already hampered by frequent joint discomfort, its not too late. We think you’ll see real results that will help you “get back into the game” – and keep you there. Life’s active pleasures are endless. Ultimate JointFlex guarantees that you could never be forced to watch them from the sidelines! Let your creakiest joint be the judge! 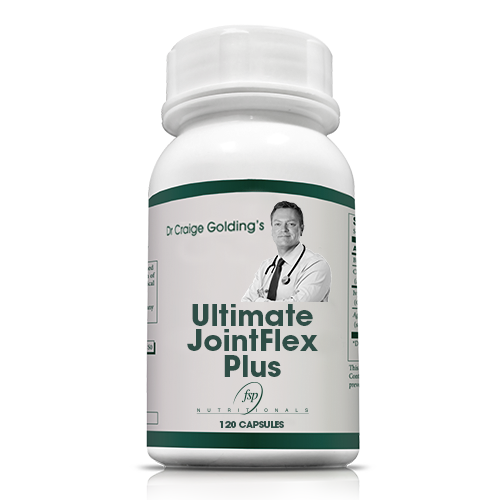 I know that Ultimate JointFlex is helping my joints stay strong and flexible. And with my hectic non-stop lifestyle, that’s saying something! I’m just as confident about what Ultimate JointFlex can do for you, too. That’s why I’m inviting you to use it daily for up to two full months without risking a cent. I have even included a simple “before and after” Report Card for you (below) that lets you conduct your own 60-day “clinical trial”. Print it and clip it now while it’s handy and use it to judge its full effectiveness for yourself. If you’re not pleased with the results within 60 days – for any reason – just return the unused portion (including any free bottles) and we’ll issue a complete refund. Gets a whole new lease on life! Bounces back betterwith Ultimate JointFlex! "After many years of Arthritic suffering and after trying all the present products available, I decided to try your Ultimate JointFlex and can report as follows: I commenced my programme on Monday 12th November. I noticed an immediate advantage in that within a couple of days my previously stiff knees where no longer stiff and painful when getting up from my desk. By Saturday 17th (5 days after commencing) I was walking up the staircase at work with no pain whereas previously it was so painful climbing the stairs that I was considering moving my office. The pain in my hands had by now completely disappeared and life was worth living again. I write this after 15 days of taking the capsules and can confirm that my knees are almost back to normal despite having been told that I needed a knee replacement. To me this is a miracle and if things continue to improve at this rate I will be wanting to run marathons. I am extremely excited with the improvement in such a short time. Thank you, thank you a thousand times"
When good painkillers turn bad. We’ve all taken over-the-counter painkillers like acetaminophen, naproxen and ibuprofen at one time or another, and they can be a blessing. But they do have a dark side. These supposedly harmless pills are linked to 80% of cases of gastrointestinal ulcerations and bleeding – 10% of which are fatal. Prolonged use of these non-steroidal anti-inflammatory drugs (NSAIDs) can also cause stomach irritation, high blood pressure, diarrhoea, peptic ulcers, kidney failure and liver damage. Prevention magazine reported that complications from OTC pain relievers kill 16,500 people each year – an average of 45 needless deaths every day in the US alone. And as for potential risks of prescription NSAIDs, the recall of Vioxx, Bextra and Prexige speaks for itself. Ultimate JointFlex – brimming with nutrients that fuel your active lifestyle! Ultimate JointFlex’s exclusive 11-in-1 formula goes well beyond joint health to help you enjoy a more vibrant, healthy life! MSM is a powerful metabolism booster that helps your body absorb nourishment and produce energy. It also helps flush away toxins! EPA and DHA support cardiovascular health and help maintain healthy cholesterol levels. Ginger Root has been used for centuries to aid digestion and strengthen the immune system. Boswellia serrata also helps maintain healthy respiratory and digestive systems and relieve menstrual cramps. Vitamin E is a powerful antioxidant that offers protection to increase heart health, vision and regulate blood sugar levels. Vitamin C is an immune stimulant and antioxidant used to promote heart and circulatory health. Vitamin D is essential to the synthesis of joint-lubricating synovial fluid and strong healthy bones. Proanthocyandins derived from common red wine grapes are potent antioxidants that neutralise free radicals. Your painkillers may alleviate symptoms, but they don’t help your joints. You could get caught up in a cycle where first you suffer the symptoms. Then you suffer the side-effects. When your joints get worse, you’re back where you started – only now with more aches, more pills, more side-effects, more risks. Does that make sense when there’s a better alternative? With Ultimate JointFlex, youcan soothe your joints, rebuild cartilage and halt the deterioration in your joints – safely, naturally and without the dangerous side- effects! Convenient automatic delivery. With SmartShip, you’ll never worry about running out of Ultimate JointFlex. Each month, you’ll receive a fresh supply delivered to your doorstep automatically. Low price guarantee. You’re guaranteed today’s low price for 12 full months. No strings attached... you can cancel your SmartShip delivery at any time just by calling our call centre. Pay as you go. You’ll only be charged one month at a time from your second shipment, when your Ultimate JointFlex is dispatched. Plus you can cancel at any time with no further obligation! That’s right! Buy two and you’ll get one FREE – or better still, buy 3 and you’ll get 3 bottles FREE! Imagine…for about R7 a day – less than the price of a cup of coffee – you could nourish and protect your joints... and retain the active, healthy lifestyle you deserve! Finds replacement for recalled painkiller! Works better than prescription remedies! Blessed relief for Mom – at long last! So why not put Ultimate JointFlex to the test? Just click the "ORDER NOW" button and we’ll rush your supply of Ultimate JointFlex at these money-saving prices. How soon will you see results? Some Ultimate JointFlex users have reported dramatic results in as little as a weekend. Others, a few weeks or a month. But the best results come when you make it part of your daily health regimen. When you stick with Ultimate JointFlex for the long run, you’re providing your joints with the nourishment they need to repair themselves and stay flexible and strong. That’s why I recommend you start with a 6-month supply – but let me urge you to try at least a three-month supply. Remember, the effects are cumulative. The longer you take Ultimate JointFlex, the better you can feel. You’ll notice a gradual difference with each passing week, until finally it hits you... your joints feel more flexible, more mobile and that morning stiffness is gone! Order your supply of Ultimate JointFlex today and take a big step toward a lifetime of mobility, flexibility, and independence. And remember, FSP Nutritionals guarantees your complete and total satisfaction... or you pay nothing! P.S. Get up to 3 bottles FREE! With this limited-time offer, you can get 3 Free Bottles of Ultimate JointFlex. That’s a saving of R1349.95. Remember, your satisfaction is completely guaranteed. P.P.S. Remember to print, clip and save your “before and after” Report Card – to prove for yourself that Ultimate JointFlex does everything we promise in your 60-day risk-free trial! When you stick with Ultimate JointFlex for the long run, you’re providing your joints with the nourishment they need to repair themselves and stay flexible and strong. This product contains NO yeast, wheat gluten, soy protein, milk/ dairy, sodium, sugar, starch, artificial colouring, preservatives or flavouring. Not suitable for people allergic to seafood. Diabetics should only use this product under the supervision of their healthcare practitioner. If you are using blood thinning medication, such as warfarin, consult your healthcare practitioner before using this product. Discontinue use at least 2 weeks prior to any surgical procedure. You won’t risk a cent of the product price. Not for your long and healthy, life. Yes!... A 100% CUSTOMERSATISFACTION GUARANTEE! If you’re not thrilled with the way you feel with Ultimate Joint Flex, you can simply return the unused portion within 60 days and we will cheerfully refund your purchase price - in full. Just return all your bottles (used and unused) within 60 days of purchase and we'll happily give you a 100% refund.